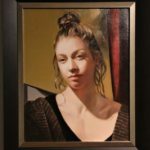 The Faces of Ontario showcases juried portrait style paintings that realistically depict people. Portraits can be head and shoulders, three quarter length or full length. Technique and expression are important. The focus is on the face; however, the setting and overall painting could be a real asset if they are within the theme of Paint Ontario. 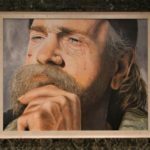 Any or all mediums of paint, pencil, pastel, or encaustic (but not photography) can be used. You must have the permission of the person you have painted. Please do not submit your work unless you have confirmed this and can demonstrate it to us if asked. The painting must be for sale. The size cannot exceed 36 by 48 inches or be smaller than 8 by 10 inches including framing. The first prize is $750.00, the second prize is $250.00, plus there is 1 honourable mention of $100. Now in its second year this portrait category is a great addition to the show. Last year’s winner was not only expertly painted but it hit the mark on so many levels. The sheer emotion depicted in this gentleman’s eyes pushed it over the top for the judge and the audience. 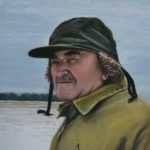 Along with the theme we encourage the artists to tell a story when considering entering the Faces of Ontario. We will be hanging a maximum of 8 of the top portraits including the winners. All Paint Ontario rules and fees apply. 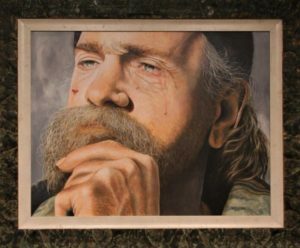 Our judge will be the very talented and accomplished artist Brian Smith.